Karin Whittaker of Karosa Jewellery, designer of hand-crafted silver jewellery, has offered us two stunning sets of earrings to giveaway. 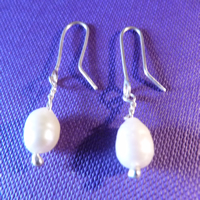 You have a choice of these beautiful pearl drops or silver hearts. Karin is based in the stunning Forest of Dean in Gloucestershire – England’s largest oak forest. She works with silver using techniques such as reticulation, hammering, forging and etching. The silver is sourced through a UK bullion recycling company and is recycled 925 sterling silver. The pearls used by Karin are traded ethically by a charity based in the Philippines, which supports local communities there. Find out more about Karosa Jewellery here. Buy any book from our shop and get a free print of Lorah-Kelly’s well known original drawing – A Naked Man. To claim your free artwork, post a photo of you smiling with your book on our Facebook page and I will send you the artwork as a thank you.